Roof coatings for institutional and commercial facilities are available with a range of properties and types to fit a multitude of purposes. The primary advantages of roof coatings include their economical, proven performance lives and their ease of use. Roof coatings are one- or two-component products that installers can apply directly from the container. Lower viscosity fibered and non-fibered. These products are formulated as top coatings. Some of these coatings incorporate pigments to reflect the damaging rays of the sun, creating a roof that performs longer and is more energy efficient. Higher viscosity and heavy bodied. Coatings in this group are designed for patching and repairing roof leaks, and they can serve as a solution to extend the life cycle of a roofing system. Before any work can be done, managers and coatings installers need to be aware of any active warranties for a new or existing roof. Installation of a coating might violate the warranty during the period it is in force. The terms and conditions of a coating warranty should provide a process for installing accessory roof components, including roof coatings. Before installation, managers should contact the warrantor and get written authorization stating that the coating to be installed will not void the warranty. The roofing manufacturer might require a pre- or post-inspection and offer specific steps to prepare the roof for the coating application. Once managers have specified a roof coating and determined that additional work will not jeopardize the integrity of the current warranty, the application process can begin. Managers who understand the way that membrane and metal roofs are installed on facilities can make sure the roofs are prepared properly before any coating application. Membrane roofs are commonly installed over an insulation layer. 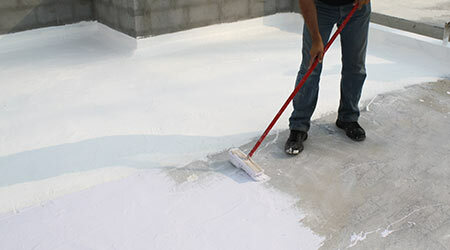 Workers should remove wet roof insulation and replace it prior to applying a roof coating. If a roof is or has leaked, it is possible wet insulation remains in place. In some cases, wet insulation is detectable simply by walking on the roof, but it is better to use a more exacting method to locate wet insulation, such as an infrared scan. Metal roofs are commonly installed over a solid roof deck or over purlins and insulation. Observing the underside of the roof system can help identify areas of deteriorated deck, wet insulation, or other damage that workers should repair prior to the coating application. Regardless of the roofing substrate, workers should thoroughly clean the roof before the application by following methods from both the existing roof systems manufacturers’ recommendations and the roof coating manufacturers’ requirements. They also should allow the roof to dry thoroughly to ensure a successful coating application. Worker need to take special care to not damage the membrane seams. Pressure washers, when approved for use by the existing roof manufacturer’s recommendations, should not disturb the integrity of the underlying roof membrane, particularly where there are adhered seams. Workers should refer to the relevant coating manufacturer’s specific requirements for roof preparation in regard to the use of pressure washers. Rusted metal roofs can be coated after the rust has been addressed. If the roof has white rust — zinc or aluminum — workers can coat it after cleaning. If the roof has red rust, workers will need to remove the rust or treat it with a corrosion-inhibiting primer. They also should treat or replace rusted fasteners. A primer is no substitute for thorough cleaning. Workers should clean off dust, chalking film, bitumen exudate, greases, oils, and other loose debris before the application of coatings, and they should complete any required roof or flashing repairs allow the surface to adequately cure.